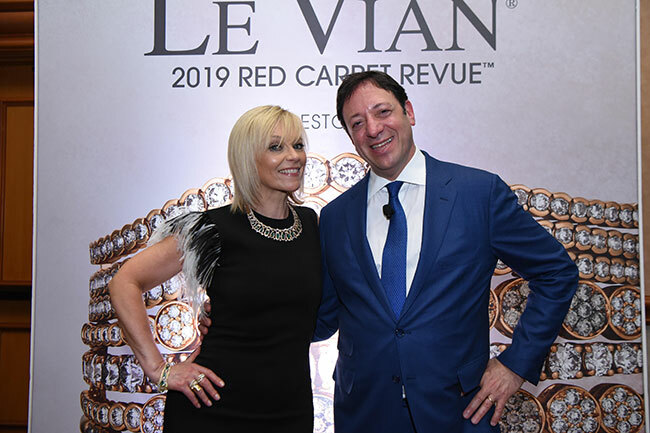 Mathews, who also cohosted the event last year, said his return to the Le Vian stage made him an honorary member of the Le Vian family. “I think this means the adoption is final,” he said. The funnyman was joking, of course, but the importance of family surfaced as the dominant theme of the event. Le Vian is, famously, a family-owned company. And before models walked the runway, company CEO Eddie LeVian and president Moossa LeVian brought up to the stage several smiling grandkids—the future generation of the Le Vian dynasty—to help explain their love for family and for jewelry-making (dual passions the brand shorthands as “Le Vian Love”). Avril Graham, executive fashion and beauty editor for Harper’s Bazaar, who presented a spate of trends for 2019 during the event, also called herself an honorary member of the Le Vian family. 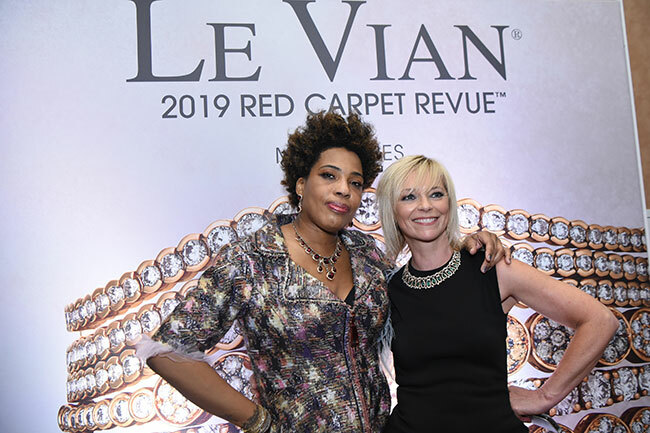 Le Vian is a longtime advertising partner of the magazine, but she and the magazine’s editor, Glenda Bailey (who spoke on video), said the relationship goes beyond business. The C2-C3 natural color diamonds “offer value and are complementary to fashion and beauty trends,” read a press release on the forthcoming product. For obvious reasons (Harry and Meghan! ), a royal theme—manifested as Le Vian “tiara” rings and majestic three-stone and cocktail styles—feels especially timely. Le Vian’s Baguette Frenzy collection of jewelry with baguette-cut diamonds includes nontraditional settings and pieces with clusters of baguettes. Le Vian will be offering an avalanche of rings with linear designs, featuring plenty of negative space. The rainbow and multicolor trends will calcify in Le Vian’s collections of pieces featuring a pantheon of colored sapphires (the company’s 2019 Spring Colors of the Year are “Multicolor Rainbow”). The brand is latching on to a larger trend for jewelry that celebrates everyone’s best friend—the dog. The event’s runway show featured models styled in a combined $20 million in Le Vian jewels and clothes from Missoni, Marchesa, Salvatore Ferragamo, Alexandra Vidal, Pucci, and Jason Wu. And the evening ended with a fun and memorable performance by soul/pop singer Macy Gray.